As Cincinnati snow removal specialists, we take care of all of your winter weather related issues! Residential, commercial or industrial snow removal needs, call us. If you are looking for snow removal help in Cincinnati, call now. One time clearing or contract clearing we can help. Do you need to have ice removed from your parking lot, driveway or sidewalks? We offer salt and calcium chloride application services as well. We will apply your choice of chemical melting agent or plan rock salt to ensure that your paving surfaces are clear of ice and snow. Residential, commercial, big or small, we can handle your snow and ice weather related issues quickly and efficiently. We can help keep you and your guests safe! 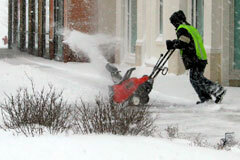 At Cincinnati Landscaping our service in Cincinnati Snow Removal is what sets us apart. Most snow removal contractors just remove snow in the areas that can be done with a mechanical device. Our specialized snow removal crews remove all of the snow from not only the easy to get areas but all of you sidewalks and other access points to your property. We set the standard in the snow removal business in Cincinnati and Northern Kentucky.